After the guard tower photo incident and avoiding time in a gulag, I was wary but still curious when we arrived in West Berlin. A cosmopolitan modern city, West Berlin didn’t have a dreary, dour communist vibe at all—which was what I expected despite it being a weird island of democracy. 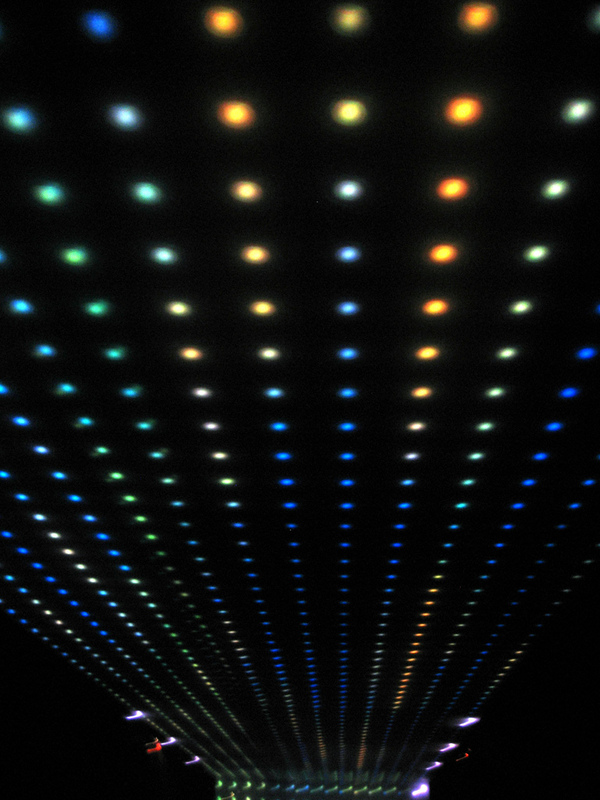 Really, it was more like a massive Avant-garde nightclub, pulsating and launching neon light streams everywhere in a party scene that even offered underground bars. As college students, my friends and I headed straight to the subterranean establishments. To be honest, however, I don’t remember as much about life in West Berlin, because what lay beyond the free zone was far more compelling. Before heading over to East Berlin, which was not a simple task since it entailed going through the infamous Checkpoint Charlie, we visited the Berlin Wall. A historic symbol, now virtually gone, but at the time, it was dramatically political, powerful and poetic. The history of Berlin’s division is complicated to say the least. Basically, at the end of World War II, Germany was divided into four sectors—the Soviet influenced East Germany and the Allied (US, France, and Great Britain) influenced West Germany. Berlin, located in East Germany was also divided into east and west sectors. 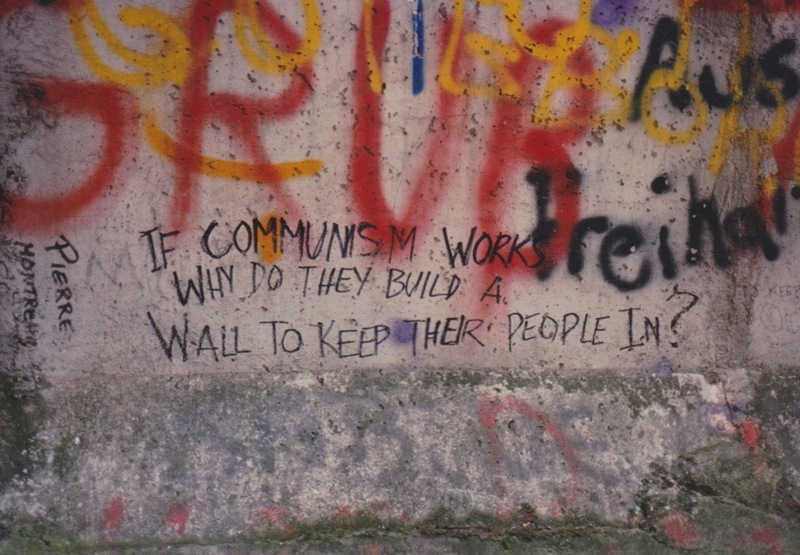 In 1961, during a period of extreme Cold War tension, the East German government with the approval of the Soviet Premiere, Nikita Khrushchev, decided to build a wall to keep residents of East Berlin from defecting in droves to West Berlin. It started out as a barbed wire and concrete block barricade and ultimately became a reinforced concrete wall 12-feet tall with a “no-man’s land” or “death strip” lined with guard towers, fencing and patrolled by soldiers, dogs and trip-wired machine guns. 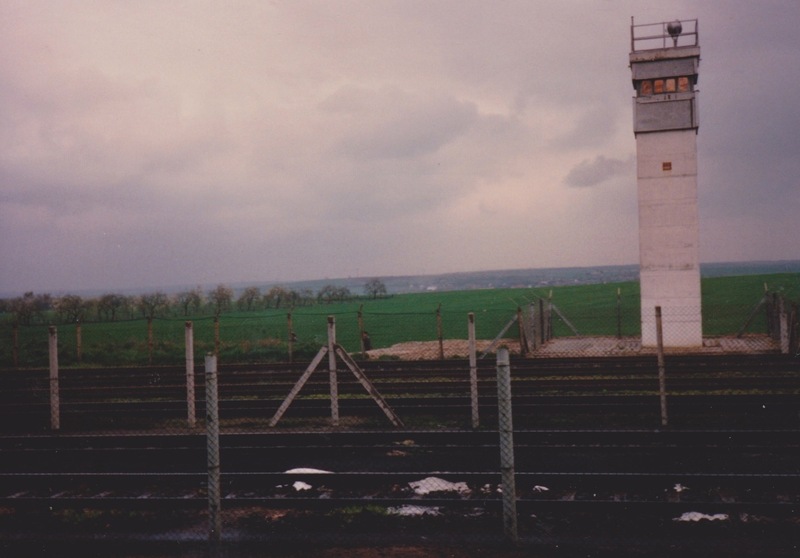 Tragically, 171 people died while trying to cross to the other side, but 5,000 East Germans succeeded in making it over, under or around the wall. When the wall “fell” in November, 1989, friends and families who had been separated could cross the east/west border and hug for the first time in decades. But in April 1989, the wall was still very much a barrier—a concrete curtain. In West Berlin, constant images of the tragic division were emblazoned on post cards, art and posters. 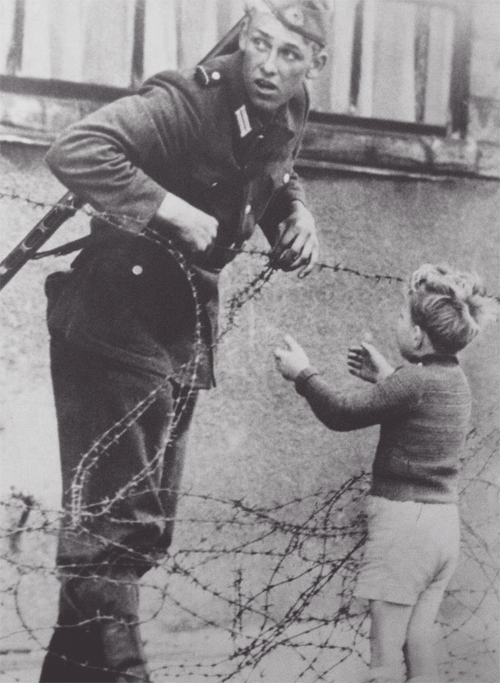 The photo of an East German soldier jumping over barbed wire, escaping to the west during early stages of the wall’s construction was sobering enough. Knowing I could freely travel to both sides and that people separated from their families for decades could not, intensified the experience. I felt guilty walking casually along the free side of the wall while looking up at grim empty apartment complexes that were mere meters from a life of possibilities. The Berlin Wall was the first in-your-face historical sight I had experienced while traveling. 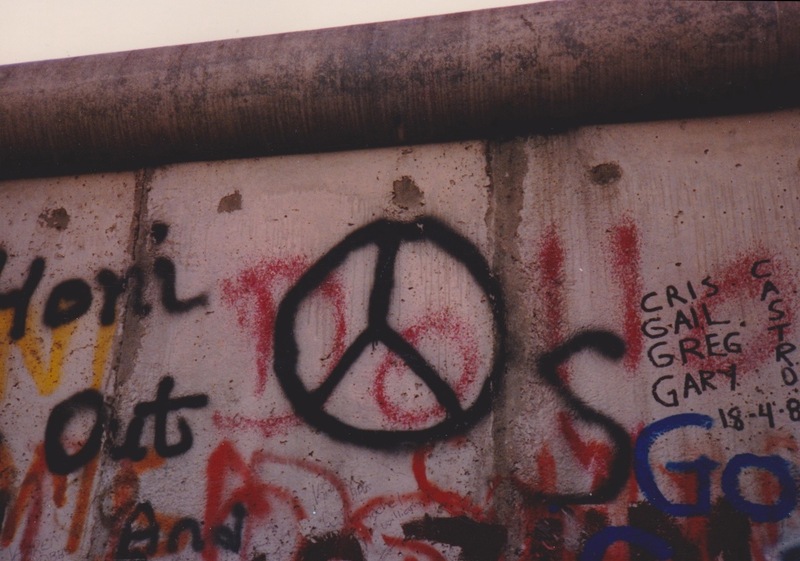 At the time, I could check off on my travel list icons like the Statue of Liberty, Washington Monument, Golden Gate Bridge, Eiffel Tower, London Bridge and even windmills in Holland, but the Berlin Wall was symbolic on a much larger scale. With its endless graffiti, and various murals it conveyed direct statements of injustice and oppression as well as portraits of rage, confusion, frustration, peace, whimsy and declarations of love. 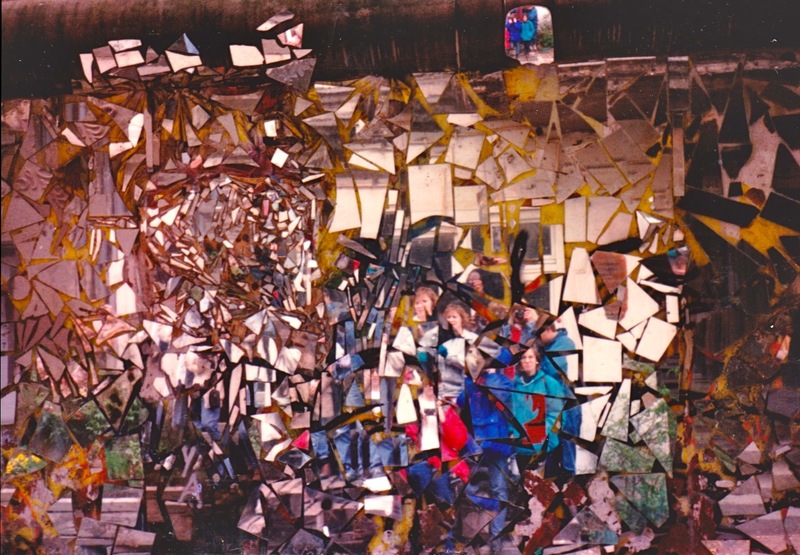 A shattered mirror attached to a small portion of the wall caught my attention more so than the rest of the wall art. It was such clear metaphor of destruction. Yet, it really wasn’t, as I found out after crossing to East Berlin. Indeed the east side was communist. 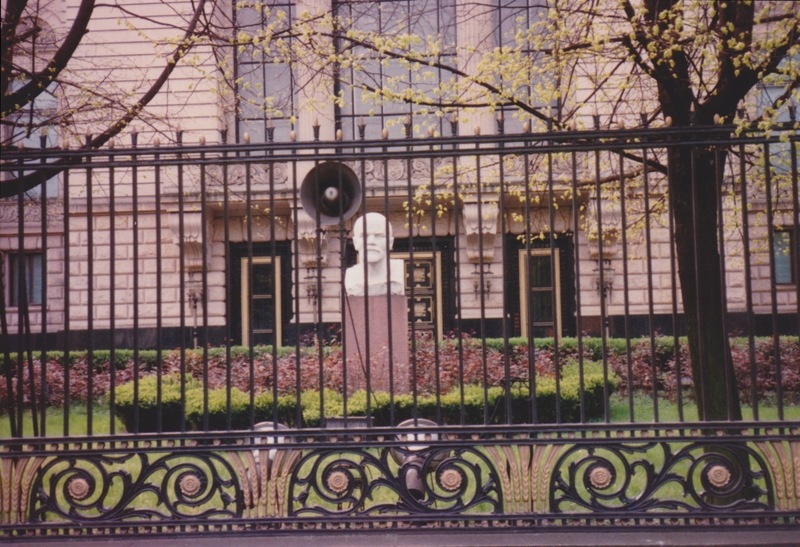 A bust of Lenin (ironically through a gate) and statues of Karl Marx and Friedrich Engels reminded you of which ideology dominated this part of Deutschland. However, on the other side of the wall, people lived their lives. 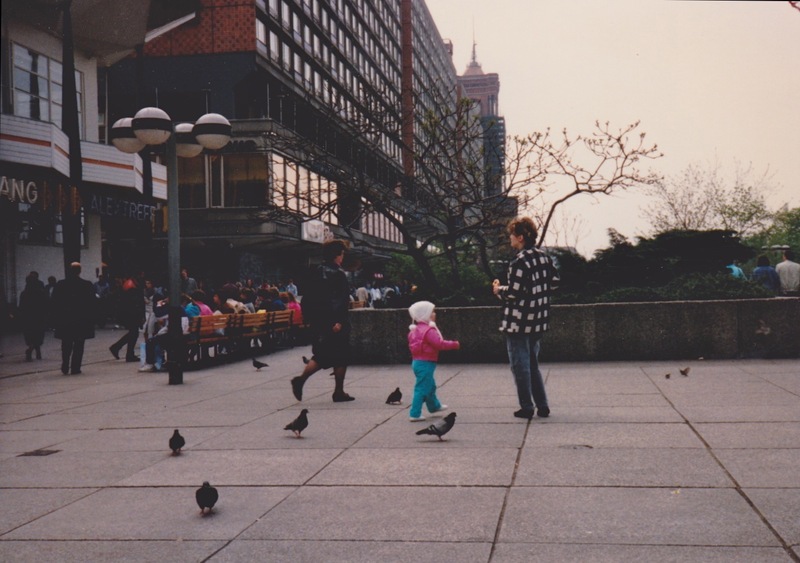 Children chased pigeons, people shopped, went out to eat and laughed. There was even a mall—granted it seemed like a mall that would showcase burnt orange shag carpet collections as well as yellow and avocado vinyl furniture sets straight from the 1970s. But it was a mall, nevertheless. Of course, we were only seeing the surface of East Berlin, but the surface was pretty pleasant. 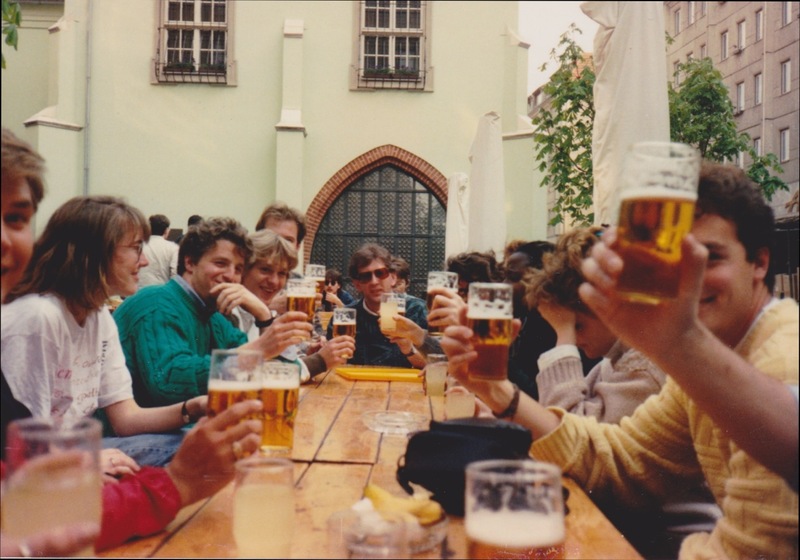 That day, our study abroad program director made a reservation at a restaurant that was, indeed, “charming.” It had a wooden tables and chairs, stone walls and delicious food. The wait staff was friendly and welcoming, and they even sat down to laugh and drink beers with us. It wasn’t a damp, cinderblock dungeon with cold canned soup and stale bread, which, of course one was led to believe would be the “Draconian Dinner Special” with all the negative depictions of communist countries we saw in the US. Even Marx and Engels were sculpted into two proud buddies who, frankly, looked slightly less uptight than most statues of the founding fathers I had seen in Washington, DC. 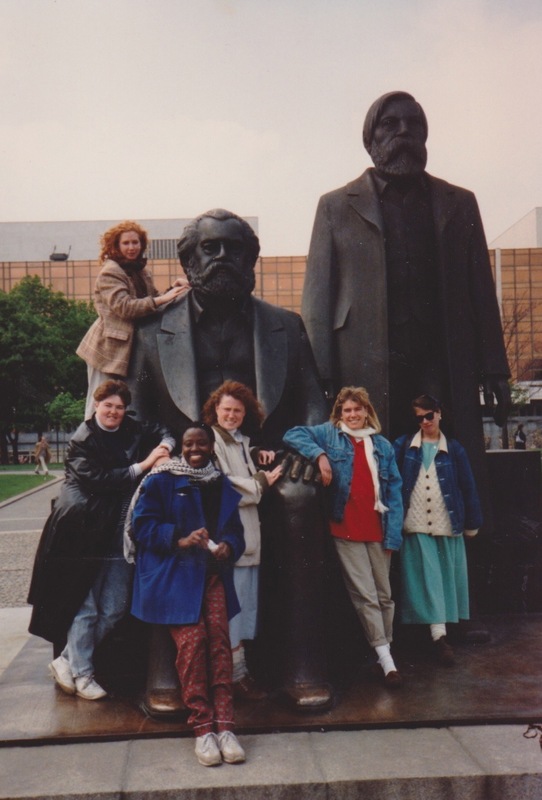 In fact, since we had been studying European history, Marx and Engels seemed so familiar that we took a photo with them. I did not want to forget the situation in East Germany, however. 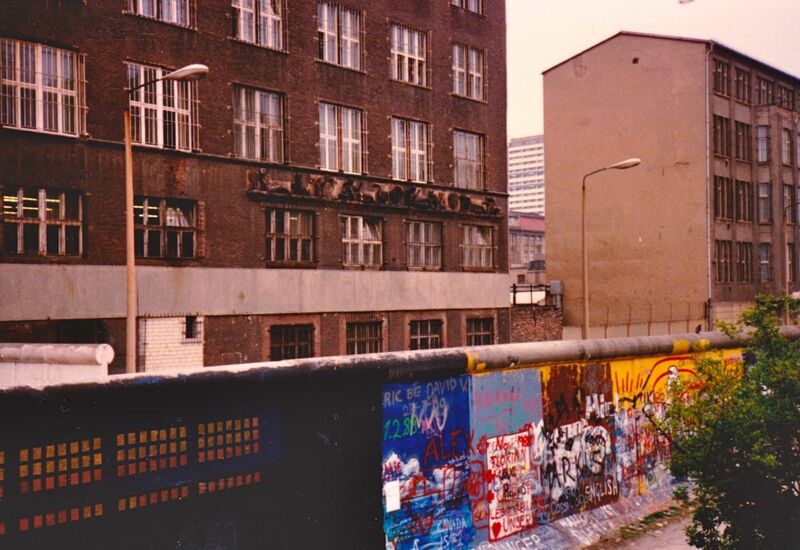 The Wall constantly reinforced the physical, and emotional division of East Berlin and West Berlin. The Reichstag and the Wall—symbolizing the struggles of Berlin. On the contrary, what my fellow students and I experienced in East Berlin didn’t seem like communism—at least the brand we saw in movies. Where was the soundtrack with the foreboding cello music? Where were the uni-browed scowling people? Where were the bread lines and parades of missiles? However, on our last day in East Berlin, an incident put more fear into me than the guards at the train station and all the communist villains in Sylvester Stallone’s movies combined. The day started out chilly, but the sun slowly blazed through the spaces between buildings as it rose to promote a clear day. 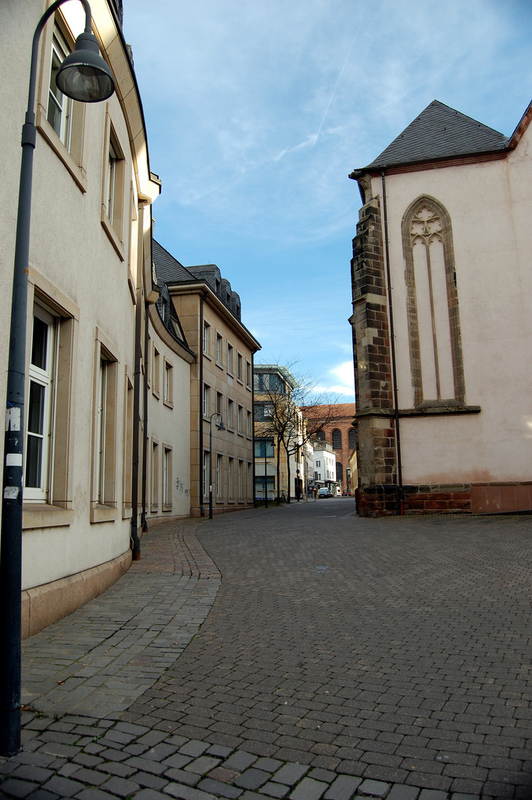 My classmates and I walked along a small cobblestoned road to search for a café. We arrived at an intersection with no compact Russian cars in sight. The roads were, essentially, deserted. Ignoring the red traffic light, and glancing both ways out of habit, we stepped in the intersection to cross. Against the light. Not a good idea in Germany—let alone the communist side. We heard gruff, stern German spewing from behind. While everyday German often sounded harsh, pissed-off German froze us in our tracks. Turning around we saw a stooped old man. He had a long wool coat and a hat that was perched on his head, not quite covering his ears or his white tufts of hair. Holding his cane in his gloved hands, he shook it up and down. Not only did we have a German geezer yelling at us, but he also was shaking his cane. Yikes! What did we do? He shuffled forward a few steps in his sensible black rubber soled shoes. He unleashed a Teutonic tirade. What was this guy saying to us? 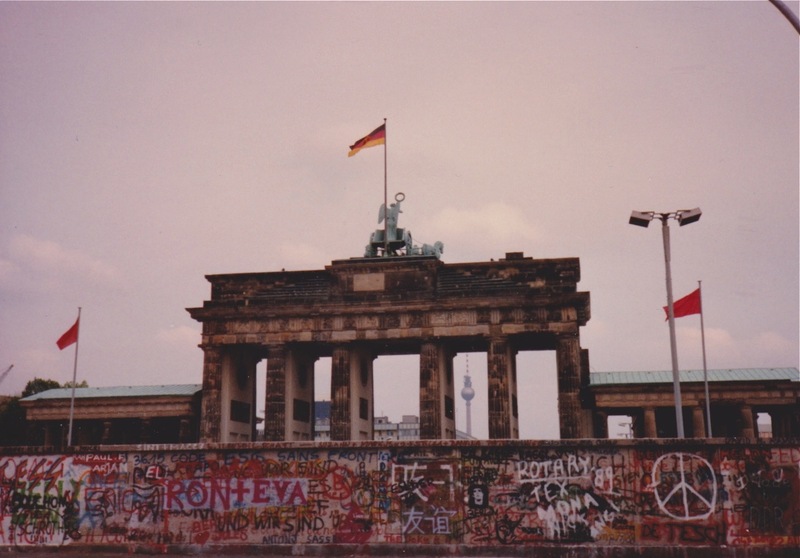 This entry was posted in Germany, Travel, Travel Humor, Uncategorized and tagged Checkpoint Charlie, East Berlin, East Germany, the Berlin Wall by stephglaser. Bookmark the permalink. I enjoyed your story, and you captured well the mystery and fear of the Berlin Wall and the Cold War. Jet, thank you! I’m glad I conveyed that feeling. It was truly one of the most fascinating trips I’ve taken, and then I watched the wall fall on TV about six months later! How much more enjoyable did the forbidden fruit aspect make the trip? Interesting story and pictures. I was stationed in West berlin while I was in the US Army from 1969 to 1971. 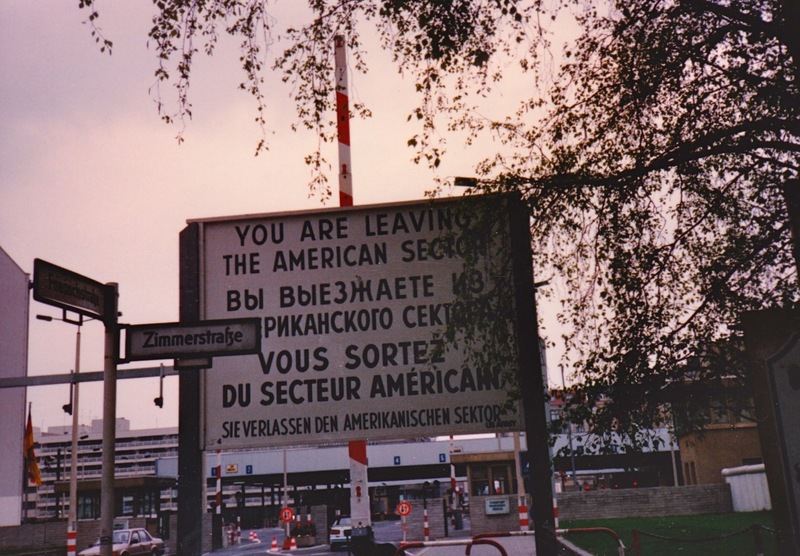 My wife and I often went through Checkpoint Charlie to East Berlin for the day (we were encouraged to do so). I was in the 287th Military Police Company, Berlin Brigade. Our unit patrolled the wall and worked the checkpoints in addition to other duties. Our car had USA license plates and I had to wear my Class A uniform so everyone knew I was in the US Army. 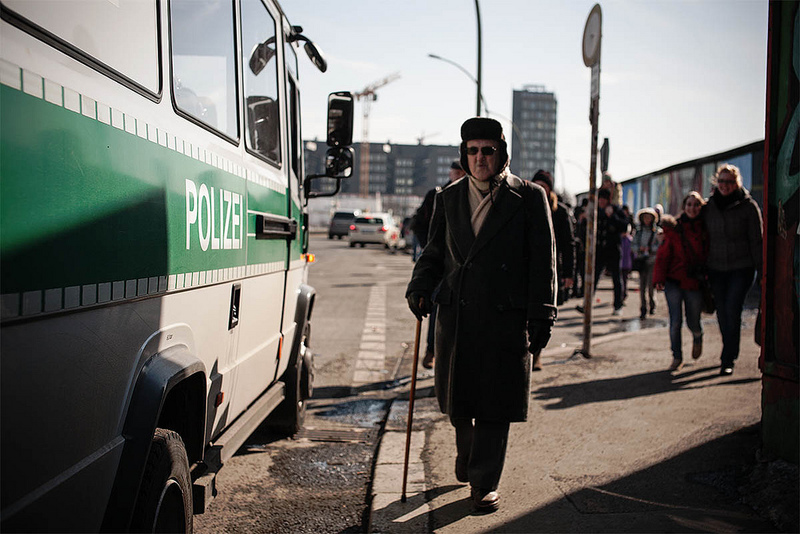 The East Berlin Police would often follow us all day and harass us. We met several interesting people in East Berlin. Thank you again for posting this story…it brought back many memories. Thanks so much for reading and for the comment, Ron! Wow — how crazy to have patrolled the wall and work the checkpoints during the late sixties and early seventies! That must have been fascinating and tense. I can only imagine how surreal it must have been to watch the wall come down (on TV for you?). I remember being shocked that it happened only a few months after I was there. I teach teach young community college students and it’s always wild to tell them about something that was so infamous that is now gone. I’m glad the story and photos brought back memories (hopefully not any terrible ones). Thanks again for sharing your thoughts. I am attaching 3 photos taken when I was stationed in West Berlin.I had them on my computer. The first is of me with a fellow GI Richard in Treptow Park in East Berlin. 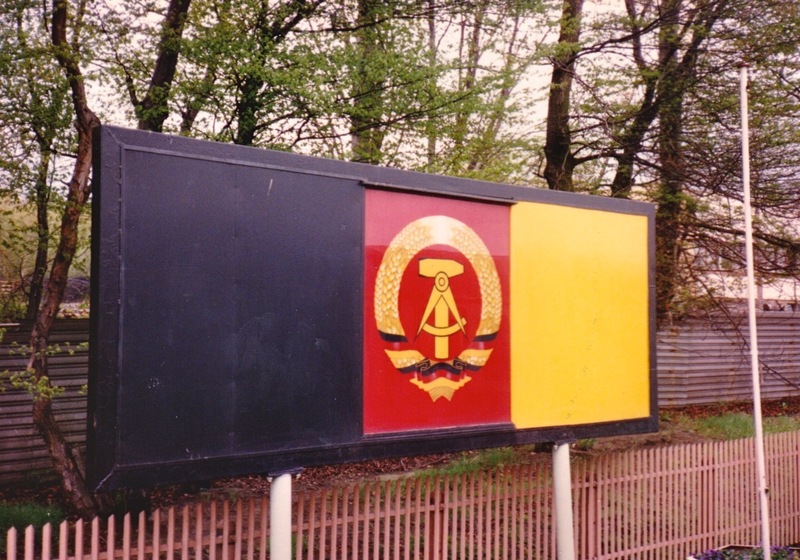 The second is of me with a Russian soldier in a parking lot off Karl Marx Allee in East Berlin. The third is a picture of Checkpoint Charlie taken from our “outlook” post in a building next to the Checkpoint. This is looking into the East along Friedrichstrasse. It was quite an experience to be stationed there!!! Ron, unfortunately, the photos don’t appear in the comments section. They sound very intriguing — especially the one of you and a Russian soldier! I can only imagine what an experience you had. It seems so strange now that we had this pivotal period in history.